This is a joint hike with the new Middle Tennessee Wild Ones and TNPS. For those that missed the 2016 trip, this is your opportunity to again see orchids and other rare plants. The “Oak Barrens” of Coffee County provides some of the best examples of TN rare plants that also occur in the Gulf Coastal Plain and the prairies of the Midwest. As a result, Coffee County is one of only three counties in Tennessee with 50 or more rare plant species. 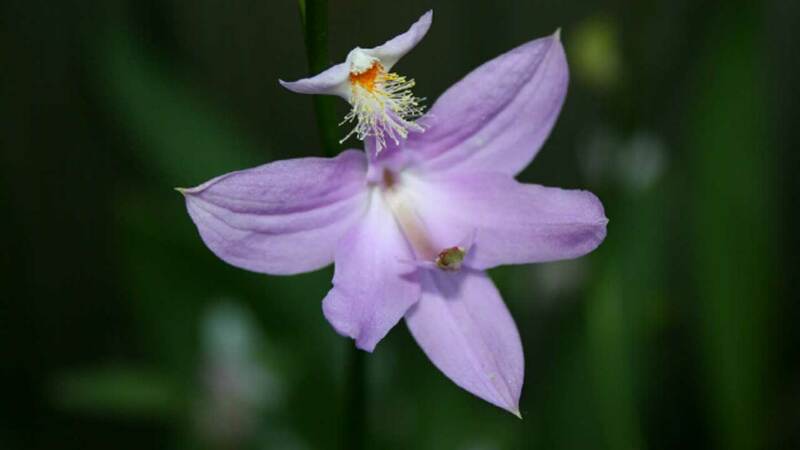 We will visit the AEDC first to see native orchids: Calopogon tuberosus, Cleistes bifaria (now Cleistesiopsis), and possibly Platanthera lacera and Pogonia ophioglossoides. We should also find Death Camas (Zigadenus leimanthoides, now Stenanthium tennesseense), Whorled Loosestrife (Lysimachia quadrifolia), and Hyssop Leaved Skullcap (Scutellaria integrifolia). After lunch time permitting we will visit May Prairie. We should see Mock Bishop’s Weed (Ptilimnium costatum), Enyngo (Eryngium integrifolium), Coppery St. Johnswort (Hypericum denticulatum), Marsh Pea (Lathyrus palustris), Horned Bladderpod (Utricularia cornuta), and Swamp Candles (Lysimachia terrestris). Difficulty: Easy to moderate walking in low vegetation. Directions: Leave I-24 at exit 114 in Manchester TN. Turn left coming from Chattanooga (right from Nashville) onto US 41 heading NW toward town. Turn right at the 1st traffic light (Raceway at that intersection) beyond the interstate. Wendy’s is half a block on the right. Lunch: Bring water, insect repellent, sunscreen, and camera. Lunch in the car or on the trail. Facilities: Facilities at the meeting place.